(Inside Science) -- No more coddling Mother Nature. Instead, we should let her fight for her own survival, competing against industries that can provide the same services, argue ecologist Guillaume Chapron and his colleagues in a recent article. For example, they write that instead of changing farming practices to protect bees and other pollinators, "we will let bees disappear and replace them by AI-powered microdrones -- which create many jobs and do not sting." The article was satire, intended to shock readers out of complacency and inspire action on environmental issues. But more than that, it was meant to model to scientists an alternative way of getting their message across. Now in a series of follow-up letters and articles in the same scientific journal that published the satire piece, frustrated researchers are discussing whether they should reach out to nonscientists with strategies more typical of late-night comedians. "If people do not listen to us conservation scientists when we speak in a sober scientific way, maybe we just need to find a different way," said Chapron, who is at the Swedish University of Agricultural Sciences in Riddarhyttan. Chapron got the idea to write a satire article after endorsing a paper titled "World Scientists’ Warning to Humanity: A Second Notice," which appeared in the journal BioScience in November 2017. That paper laid out in blunt terms how humanity has failed to heed scientists' warnings, with nearly all environmental crises growing worse in the 25 years since the Union of Concerned Scientists released an appeal entitled "World Scientists' Warning to Humanity." More than 15,000 scientists added their names to the second Warning to Humanity in time to be included in the published author list, and thousands more have signed on since publication as part of ongoing activism efforts. But after adding his name to the list, Chapron became skeptical that the earnest plea would do much good. He has seen his own findings repeatedly ignored; once, he said, the Swedish government insisted on using an old estimate of wolf populations to set hunting limits, even though Chapron and his colleagues had found the real wolf population to be smaller and more vulnerable. Chapron is from France, a nation with a strong tradition of using satire to inspire societal change. So in order to amplify the message of the Warning to Humanity, Chapron and his colleagues decided to write a satirical response, which they titled "A Final Warning to Planet Earth." The authors struggled to come up with examples that were extreme enough, said Chapron. For example, they presented robotic bees as a ludicrous idea to highlight the dangers of current policies and attitudes. Only later did they find out that such artificial pollinators are actually being developed. 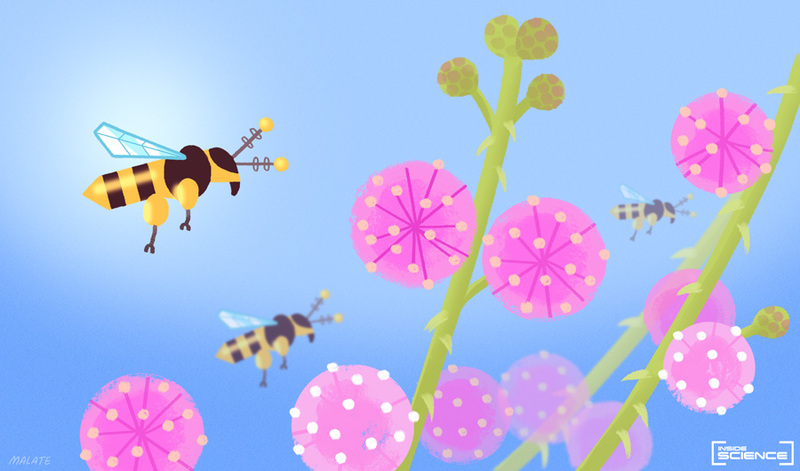 Eijiro Miyako, a nanomaterials engineer at the National Institute of Advanced Industrial Science and Technology in Tsukuba, Japan, and one of the developers working on robotic bees, wrote in an email to Inside Science that he supports pollinator conservation and does not view robot bees as conflicting with environmental goals. But Chapron fears that once people have an alternative, they will refuse to ban the pesticides they know are killing pollinators. "The fact that the world is able to put money into developing robots to replace what nature gives us for free, just because we refuse to limit the profits of chemical corporations, shows that things have gone crazy," he said. A few decades ago, he added, a satirical article might have suggested that instead of reducing greenhouse gas emissions, we should put up some sort of giant sunshade to cool the planet. Now, that suggestion is being seriously considered as a form of geoengineering. Publishers didn't initially share Chapron's enthusiasm for a satirical approach. Two journals declined to publish the satire piece, including the home of the initial warning paper, BioScience. Some editors at Bioscience and leaders of its parent organization, the American Institute of Biological Sciences, simply didn't find the article funny, said Scott Collins, an ecologist at the University of New Mexico in Albuquerque and editor in chief of BioScience. Others feared it would be misunderstood or would trigger resentment and blowback. But another well-regarded ecology journal, Trends in Ecology and Evolution, accepted it immediately, publishing it in a section set aside for personal essays and discussions rather than research or formal reviews. "The feedback has been overwhelmingly positive, with only a very few feeling that there is no place for such an article in the academic literature," wrote Paul Craze, the Bristol, England-based editor of Trends in Ecology and Evolution, in an email. Some of that positive feedback came from the authors of the second Warning to Humanity article that inspired the satiric response. "I thought it was very well-written, and clever, and a breath of fresh air," said William Ripple, first author of the 2017 World Scientists' Warning to Humanity and an ecologist at Oregon State University in Corvallis. Ripple and his colleagues sent a lighthearted response to Trends in Ecology and Evolution expressing their support for the satirical approach, and Chapron's team followed up with an article discussing how satire might be used for conservation. No one is suggesting that researchers abandon traditional modes of scientific communication, Chapron noted. Scientists serve a crucial role by gathering information about the world, and they must present that knowledge in the most straightforward way possible. Indeed, said Chapron, despite the cascade of letters and articles, satire should probably have little if any role in peer-reviewed scientific journals. But when scientists have presented their findings using traditional methods and been ignored by policy makers, it may be time to speak to the public directly using satire, said Chapron. For example, they could publish satirical op-eds in newspapers, or create satirical blogs or YouTube videos. Humorous media such as The Onion and Saturday Night Live use satire all the time, and traditional news outlets use it more sparingly. But Chapron's impression is that most professional satirists tend to focus on political and social issues, rarely lending their powerful wit to environmental causes. That may be because professional entertainers tend to go for low-hanging fruit, said Heather LaMarre, a media psychologist at Temple University in Philadelphia who studies how satire is used and interpreted. Environmental scientists focus on long-term issues that take decades to develop, she said, while most comedians would rather jump on the most provocative thing in the news today. "Science topics tend to not really hit the top of the agenda for comics," she said. "That doesn't mean they can't, but you have to find the comic or the show that's willing to take the audience there, rather than just going where the audience already is." Satire is a mighty tool, well-suited to make a difference on environmental issues, she said. But LaMarre also added some words of caution. While Chapron's satire piece was impressively well-crafted, she said, scientists should know that satire is a difficult art form with the potential to backfire, so they may want to team up with professional comic writers. "I think it's fantastic they want to do it," she said. "I just would add to their conversation, they have to tread lightly and do it right. Or it will hurt their cause."